Who doesn’t love dipping fruits into warm chocolate sauce? I know I do. Just the smell of melted chocolate is so divine. 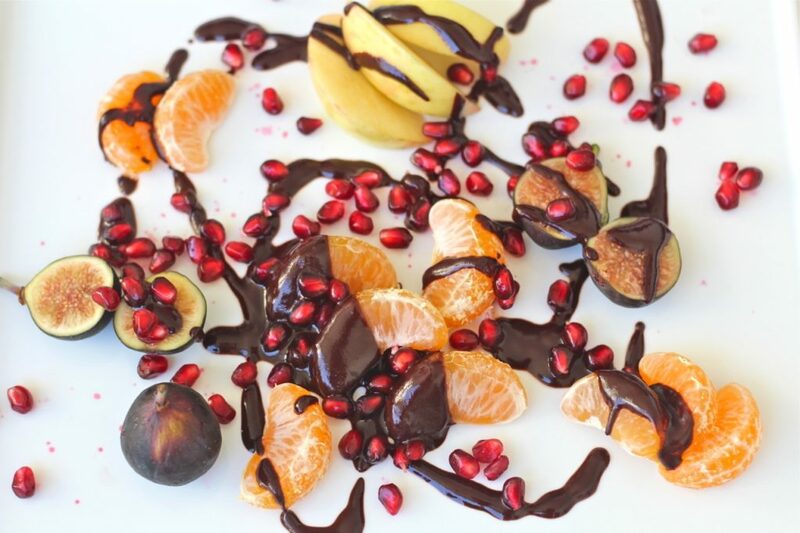 Therefore this winter fruits with chocolate sauce recipe is the perfect holiday dessert. You and your guests are going to be very satisfied because this dessert is super delicious. And it’s real eye candy too. The colorful fruits make this dish a pleasure to look at. You can either just serve all the fruits in a bowl or plate and dip them into the chocolate sauce. Or you can let your inner Picasso come out and make some fun fruit chocolate art like in the picture above. Either way it will be a hit. Winter fruits with chocolate sauce are very easy to make. You will whip this up within 10 minutes and you only need very few ingredients. But the best part about this recipe is that it is actually a pretty healthy treat. The different colored fruits will give you a good dose of vitamins and antioxidants. Raw cacao is considered a superfood due to its high amounts of antioxidants. 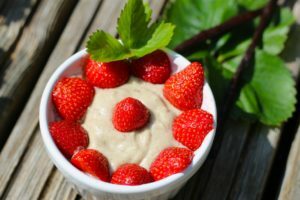 So if you would like to reap the benefits of raw cacao without the added negative side effects you can get from certain chocolate brands, try this homemade version. 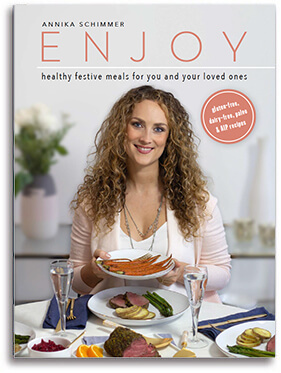 As you can see this recipe is dairy free, gluten free, nut free and refined sugar free. If you are vegan simply use another sweetener. Since the chocolate sauce is homemade, the amount of sugar is minimal compared to most store bought ones. For this recipe I only used 2 tablespoons of honey as a sweetener. The taste of this sauce feels like dark chocolate, so if you like it sweeter, feel free to experiment with the amount of sweetener. You can make this recipe with any type of fruits that are in season. Bananas, strawberries, kiwis, mangos etc. are great options. Simply pick your favorite ones and start dipping. This delicious beautiful winter fruits with chocolate sauce recipe is easy to make, has few ingredients and features foods high in antioxidants. Peel the tangerines and split them into their segments. Wash apples and figs. Cut the apples and remove the pomegranate seeds from the fruit. Heat coconut oil in a small sauce pan on the lowest heat. Add cacao powder, vanilla and honey and whisk until smooth. You can change the consistency (make it thicker) by increasing the temperature slightly (to medium/low). Be very careful not to heat too much and too long. Once the sauce turns thicker, turn the heat off and pour the sauce into a jar or sauce server. Either dip the fruits in the sauce or prepare the fruits on a plate and pour the sauce over.